hosted by ma' sister daunie. we had pbj pitas, tofutti cream cheese & cucumber pitas, and hummus-cucumber pita. 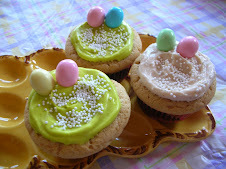 wine...lemon-lime meltaway cookies, tofutti cuties! ice cream sandwiches (in classic vanilla & chocolate)...and sesame snack sticks to keep you hydrated. we also, that day, yesterday! toured the 4th street festival and went out to lunch at L.P....fun day...and had a clothing swap at the brunch party! Daunie, Adree, Victoria, Mandi, Dory, Amy, Maggie, Al and me were in attendance! what a lovely afternoon! 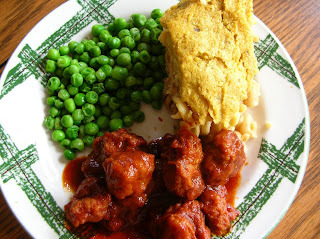 more luscious bbq seitan! with a pairing of peas & a clod of rotini mac. homemade seitan, chicken-ed, and then bbq-ed. Some lovely peas warmed up from the previous day, and a potato which i mashed up with salt and peppa'. 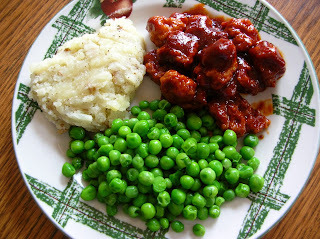 The bbq chicken seitan was really juicy and the bbq sauce was EXCELLENT. a new kind that i had bought at kroger tagged with the 'manager's special' sticker, meaning its cheap! so i bought that and then saw they had reviewed the sauce in my copy of the new VegNews magazine! It is Organicville: original BBQ sauce. It is so tangy and delish. A hearty sauce. These cormeal biscuits were not that great. They were veganized from a martha stewart recipe card of cornmeal biscuits. a bit of a weird aftertaste. but the beans were good, too much salt though. but here is a photo! 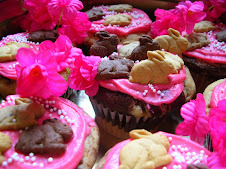 They will be oh so lovely and vegan! Absolutely vegan and deliriously delicious. I am very excited! Any ideas?? Had a very lovely lunch indeed yesterday, Saturday afternoon. I baked some tofu and faux cheese gravy and crumbled up some "Late July" crackers on top (my new loves.) and it was superb. 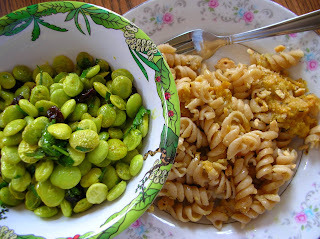 then made up some indian lima beans on the stove with raisins, lime juice, turmeric....very tasty. 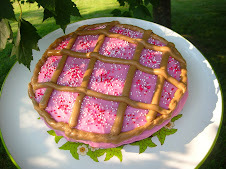 was watching martha this morning, cupcake week. so i had to bake some cupcakes. 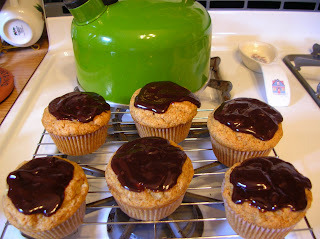 my own banana cupcake recipe with a chocolate ganache on top. terribly rich and i recieved a headache for consuming 2. ha. but still swell. These are the King of Cupcakes. 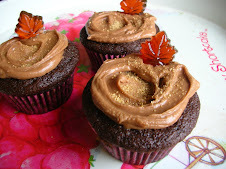 A 'vegan cupcakes take over the world' peanut butter cupcake recipe paired with my peanut butter fudge frost. These are really delectable and moist and delish. Taylor turned 13 and I made a little powerpuff girl topper for her cupcake! 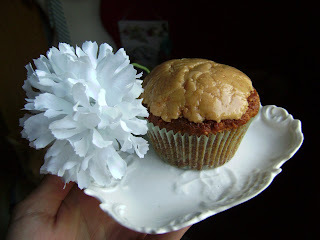 The cupcake is paired with a faux white flower and a dainty little white plate from Vienna, Austria! That I purchased at the flee market! Pasta I made a couple weeks ago, a Jamie Oliver recipe. So fresh and delicious. Little tomatoes from our garden! 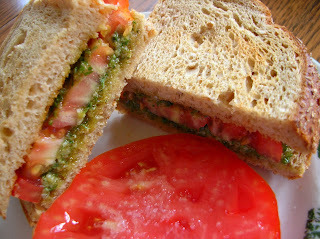 My lunch a few days ago.... Homemade pesto with basil from my garden, a tomato from my garden, and some toasted Rudi's colorado cracked wheat bread. It was really really tasty. My pesto was garlic, basil leaves, olive oil and sea salt. 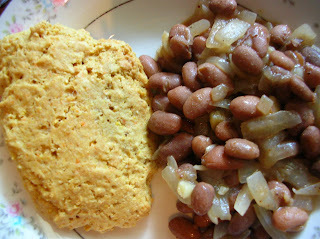 Recipe from a great little unknown vegan cookbook called "The Cookbook for people who love animals." Combine 1/2 c. nutritional yeast and 1/3 cup whole wheat white flour in saucepan. Toast over low heat, about 6-8 mins. Add 1/4 cup oil, stir in. Then add 1 c vegetable stock, or more, to achieve your desired cheezey sauce-ey ness. Then add 1/2 tsp garlic powder, 1/4 tsp paprika, 1/4 tsp dried basil, and about 1 tsp. sea salt (seal salt!) and stir in. 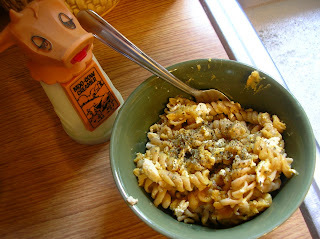 Combine cooked rotini with mashed tofu and pour in casserole dish. Top with cheese gravy and bake at 350F for 20 mins. 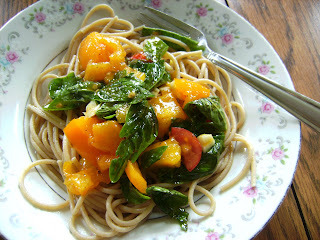 Serve sprinkled with more basil and salt and peppa'. I just realized, I forgot to add 1-2 Tbs. tamari to the sauce. You can if you want, but this is simply delicious-o. 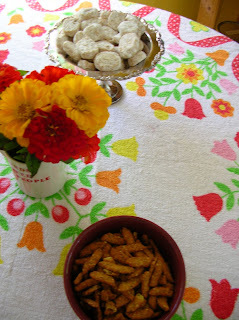 Adri/Giada's "little drops of Marilyn" lemon cookies! See Double layer chocolate mousse cake on Key Ingredient.